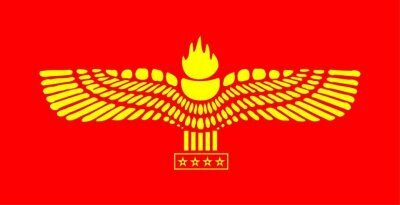 Today I read a post about the Aramean flag stating that the flame was added in the 1980s to represent the Holy Spirit. 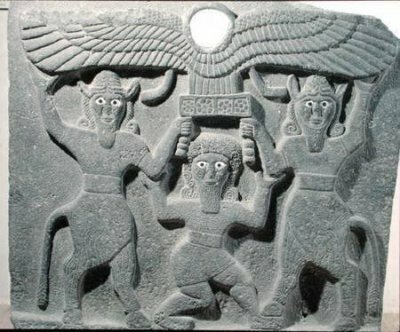 If you trace the Aramean flag to the stone carving from Tell Halaf representing Gilgamesh and Enkidu carrying the winged sun-disc, you will notice that it didn't have any flame, and nor did the early Aramean flag which was first designed in the 1970s. However it was altered in the 1980s by adding the flame. But the flame had nothing to do with the Holy Spirit because in Syriac culture the Holy Spirit is represented as a dove and not a flame, and you can see the dove all over Syriac religious art, icons, clergy costumes, altar covers, church stone carvings etc. So where did the flame come from? 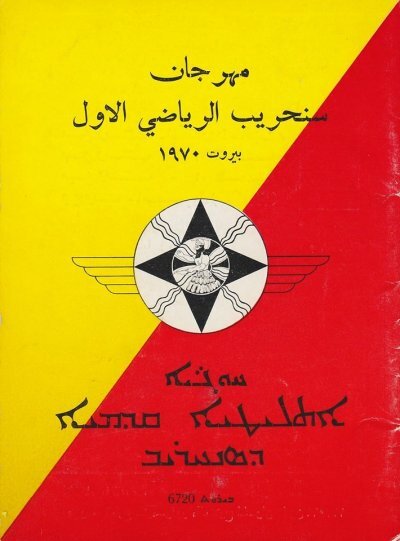 Ironically the flame on the Aramean flag came from the Assyrian symbol of Nadi Sanharib Al-Riyadi (King Sanharib's Athletic club) in Beirut Lebanon, which was founded in 1936 or some 50 years earlier. 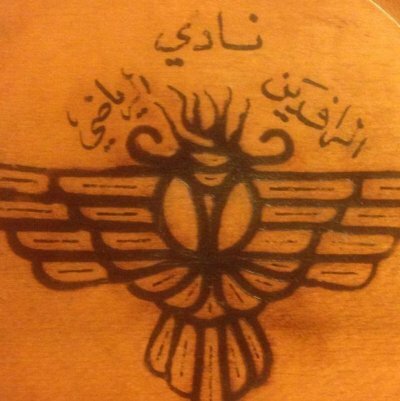 This Assyrian symbol which represented the winged Disc of Ashur had a flame at its center was very popular among Syriacs in Lebanon, and later in the 1980s, the Arameans wanted to capitalize on its popularity so they added it to their flag. 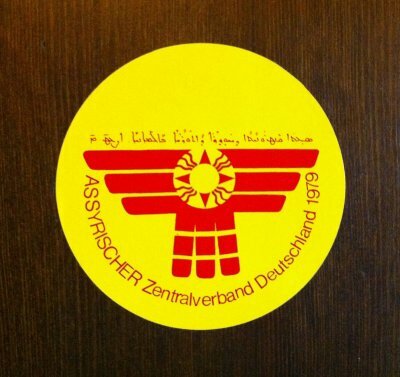 see photos below and notice that earlier Aramean flags of the 1970s had a circular disc without any flames, while the Assyrian winged disc of Sanharib had the flames at least some 50 years earlier. Another Aramean misconception is the four five-point stars inside a rectangle at the bottom of the winged disk’s tail. However that rectangle is not part of the winged disk, but rather the top of a stool, above which the winged disk is seated and carried. The proof can be seen in the two front legs of the stool which are carried by the horned creature. Additionally the original rectangle doesn’t have four five-point stars, but rather four Assyrian flowers. 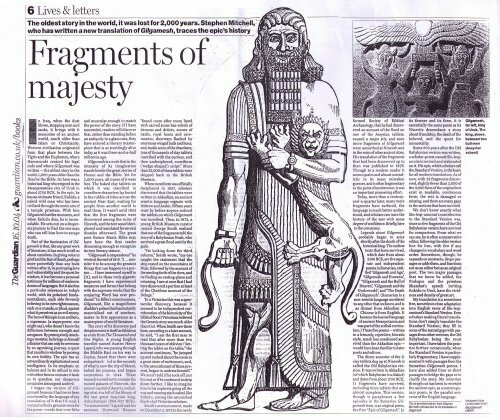 By the way the story of Gilgamesh was popular among many nations, including the Sumerians, Assyrians, Hittites, but not among the Arameans. The site of Tell Halaf (ancient city Guzana) was an Hittite city at first only after the fall of the Hittite empire the Arameans migrated in the city and took over it, later on the city was by the end of the 9th century BC incorporated into the Assyrian empire. 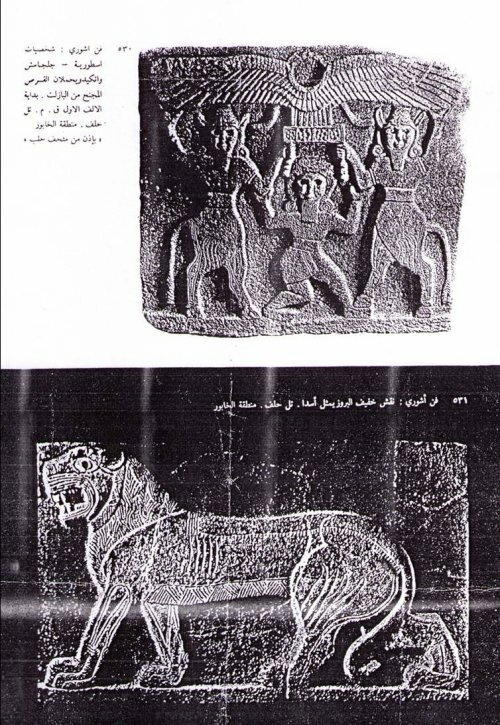 The monuments found in Tell-Halaf are of Neo-Hittite style and some of them have also influence of Assyrian art. 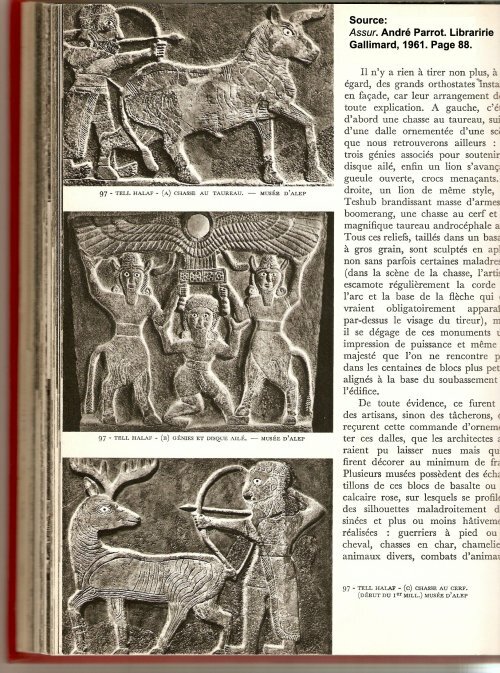 Note: The Guardian wrote an article in 2004 about Gilgamesh and showing the winged sun-disc where Gilgamesh is holding it up with two Bull-Men calling it "Assyrian"
Note: This is from Dur Sharrukin (Khorsabad), the Capital of Assyrian King Sargon II, the Winged Disc guarded by ScorpionMen. Based on an ancient drawing by Faucher Gudin at Dur Dharrukin. 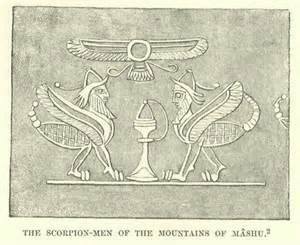 Note that the Scorpion men were mentioned in the Epic of Gilgamesh, and the Winged Disc used by the Arameans is from a bas-relief showing Gilgamesh and Ankidu carrying the Winged Disc. And that is a further proof that the two Winged disks are related. 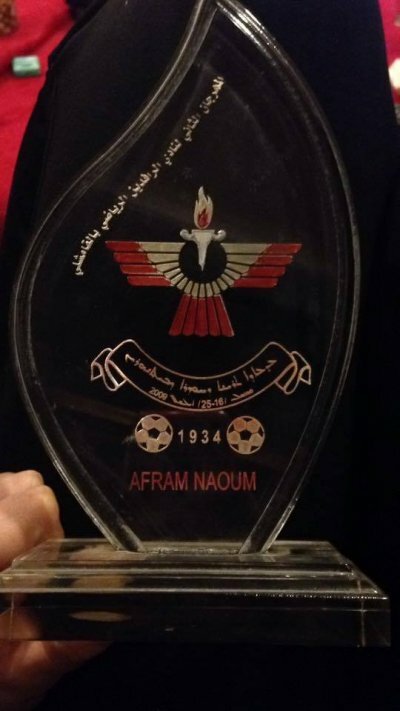 I also came upon another winged disc of Sanharib, which is the emblem of Nadi Al-Rafidain Al-Riyadi ([Bet-Nahrin] Mesopotamia Athletic Club) located in Qamishly Syria, whose members belonged to the Syriac Orthodox Church. 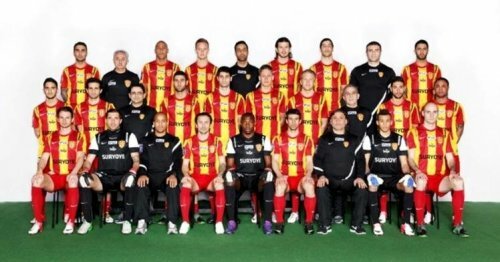 Just like Nadi Sanharib Al_Riyadi of Lebanon, this too was a football (soccer) club. 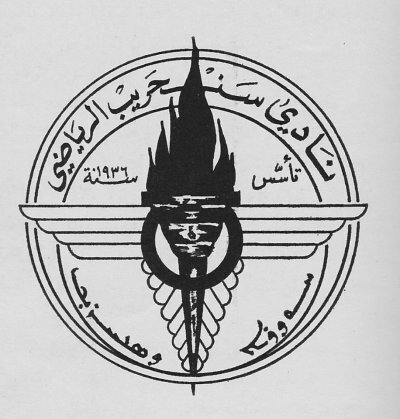 Notice the flame and torch at the center of the their emblem below. As you see the flame was used among Syriac Orthodox in both Lebanon and Syria long before the so called Arameans designed their flag. 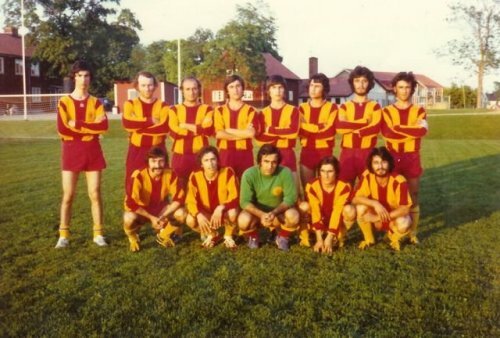 Sure the red and yellow colors are being used by Syrianska football team now, but they had hijacked them from Assyrians who have been using these colors earlier, see photo of King Sanharib Festival in 1970 in Beirut Lebanon, and notice the Assyrian star and the symbol of Ashur at the center of the red and yellow flag. 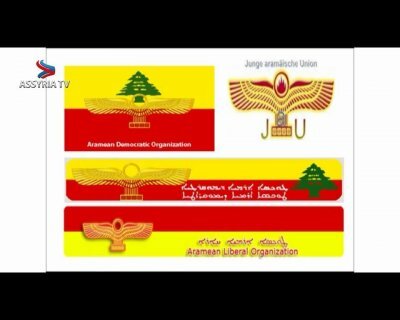 Furthermore those same colors were the colors of the Assyrian 8th Batallion flag in AlJazeera Syria during the French mandate. 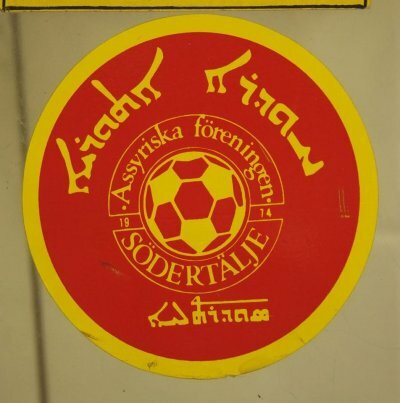 The football team Assyriska FF in Sweden also used the red and yellow colours in the early 70 before even Syrianska was established. Note: 1. 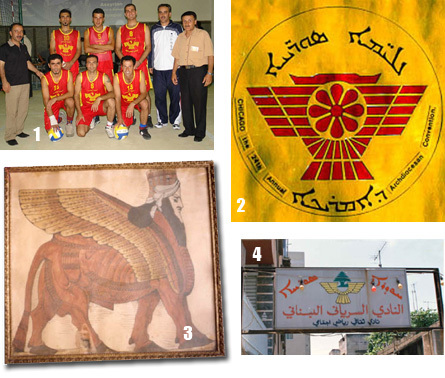 Assyrian basketball club from Syria on visit to Iran during the Assyrian Tammuz festival 2004. Note the red and yellow shirts and Ashurs winged sun disk on the stomach, 2. 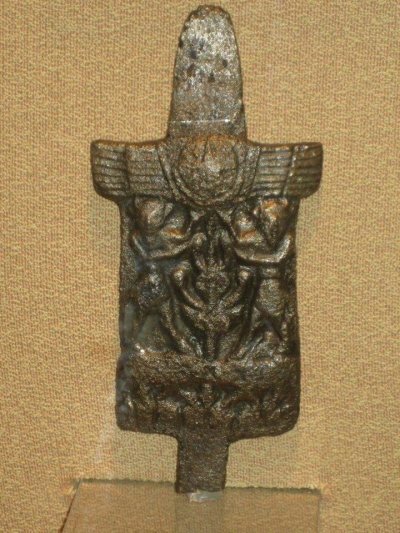 Another version of Ashurs winged sun disk. From Assyrian Youth Association of America. The red and yellow colors are clearly reflected in the symbol, 3. The Assyrian winged bull, Lamassu. This painting hung inside the Assyrian eighth battalion headquarters before the French left over Syria to the Arabs. Note the colors red on the body and yellow on the wings, 4. 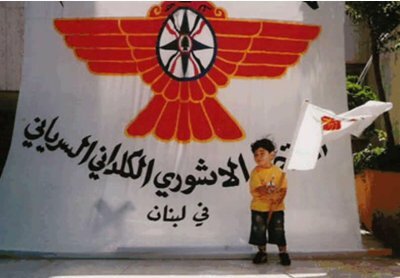 Al-Nadi As-Syriani Al-Lubnany, Assyrian Association in Beirut. Ashurs winged sun disk has been replaced by the Lebanese cedar tree instead of the burning torch. 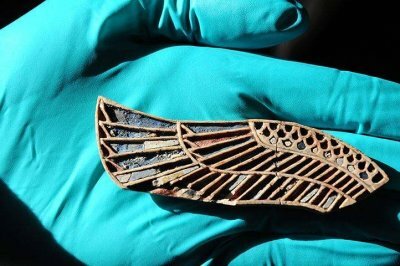 An ivory wing from Kalhu Nimrud, inlayed, and decorated with gold. 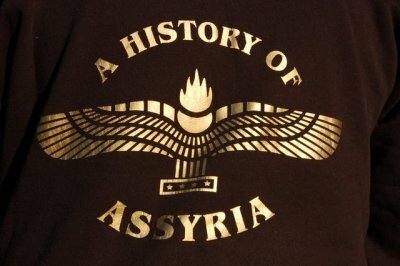 Establishing the Assyrian origin of the Aramean eagle!